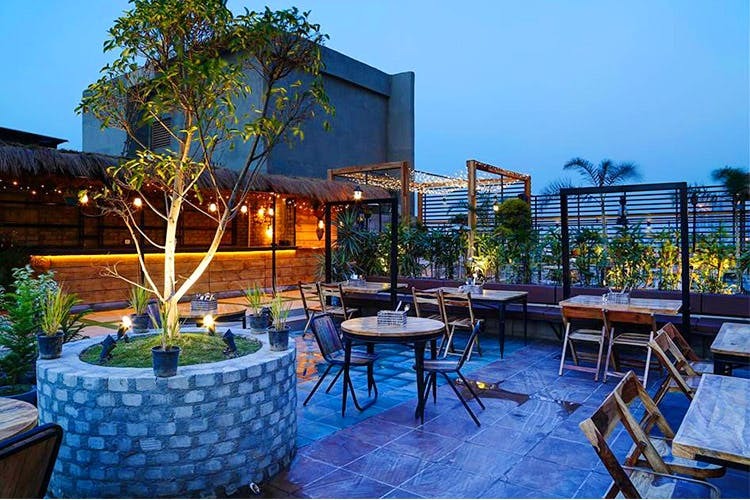 This Noida Bar Has A Stunning Rooftop Perfect For Winter Evenings! Skyhouse is a massive bar in Noida. It's located in the Logix City Centre mall and sports one of the prettiest, open-seating areas around. They’ve also got a multi-level seating plan indoors, with a wooden theme. Our love for bars with rooftop seating knows no bounds, and Skyhouse's is an absolute treat to the eyes (look at all that foliage). The indoor seating is just as eye-catching, with a rustic, wooden theme taking over the huge space. A profusion of hanging lamps and plants all over the place make it a (drunken) sight to see. So, if you like your post-work drinks or weekend scenes in a super pretty space, this will quickly make it to the top of the list. You’ll find your favourite Mughlai, Continental, Chinese, and North Indian grub here, along with a long bar menu to quench that alcoholic thirst. The Beertails & Alcopops section on the menu seems like a slam dunk (or should we say slam drunk?). It could be quite a bit of a drive for Delhi folks, especially on the weekends. This Cafe In Noida Might Be Your Next Hangout Spot!